This Webinar is eligible for 2 PMI® PDU’s in the Technical Project Management talent triangle category. If you are claiming this session, you must submit it to your MPUG Webinar History after it has been completed in its entirety. After watching this recording, please take a few moments to compete the event survey and provide MPUG with valuable feedback that will help improve future events. Thank you! There has never been a better time to break away from the grip of your IT department. Start building better dashboards yourself with Microsoft’s DIY tools. During this session, the attendee will learn how to use Microsoft’s reporting tools to build reports and dashboards using Microsoft Project and Project Server/Online. At the conclusion of this session, attendees will be able to use some of the tools available from Microsoft to build reports and dashboards using Microsoft Project and Project Server/Online. 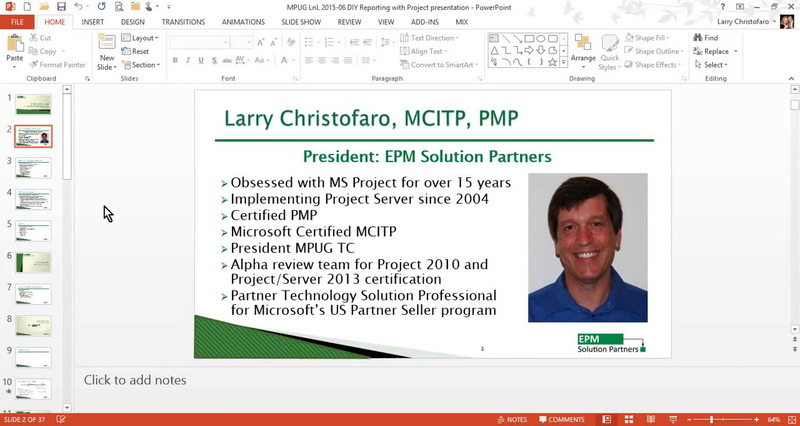 Larry Christofaro is the president and Executive Consultant with EPM Solution Partners, with over 20 years of project management experience. He combines strengths in EPM architecture and project management to successfully manage Microsoft Project and Server/Online engagements ranging from 50-2000 users that deliver winning solutions for his clients. I completed viewing the presentation and the activity code was not presented at the end. Can you please provide so I can claim PDU credit? Once you submit the webinar to your MPUG history (button below the video) the PDU code will be presented.